WASHINGTON — Detroit’s fall from grace continues to take the headlines, aside from the news of the United Kingdom’s newest addition to the royal family. Reuters reports a judge ruled in favor of the city’s emergency manager, who was appointed by Michigan’s Republican Governor Rick Snyder. The emergency manager, Kevyn Orr, has won in his lawsuit to cut the public union pensions to make the city solvent once again. As we reported at AIM, Detroit has seen its population decline from about 1.8 million at its peak in the 1950s to about 700,000 today, which amounts to over 60% loss of its population over the past 60 years. 40% of the lights work in the city, and police response times are almost an hour due to cuts to the police force. With a small taxpayer base, public services are far and few between and has taken a toll on the city with a crime rate almost double the average American city. 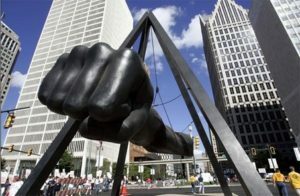 The unions fought to bench the bankruptcy proceedings because it was inevitable that Orr would seek to cut public union pensions, with Detroit sinking under $18-$20 billion in debt. To save Detroit, these generous public pensions and retirement benefits must be cut as there is no viable tax base to make up the gap. What has gone unreported by the liberal mainstream media is how Detroit has had Democrat mayors since the 1950s and whose policies eventually led to today’s bankruptcy of a former major American city. Often ignored are the string of corrupt mayors like the most recent, Kwame Kilpatrick.